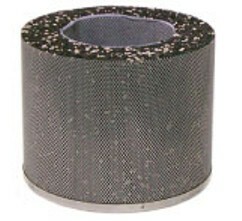 Carbon Canister Filter--contains 28 lbs activated carbon, 3" thick. Fits 6000 D EXEC model only. Great for cleaning up the air in your home / office. Effectively removes chemicals, odors, etc. AllerAir is proud to offer air purifiers that feature the deepest carbon beds on the market, with up to 40 different proprietary carbon blends. Their carbon beds are made up of actual granular pieces of carbon, not crushed carbon, and can be customized with between 4 pounds and 120 pounds of carbon to efficiently absorb any gases, odors and chemicals. The lifespan of their carbon is far greater than many competitors, and has an unparalleled absorption capacity. With increased dangers and illnesses associated with poor air quality, AllerAir also recognizes the responsibility it has to create units that provide businesses and residences with the cleanest indoor air available. AllerAir is proud of its superior carbon filtration methods, and takes it a step further by offering more options and features at an equal or better price value than its competitors.